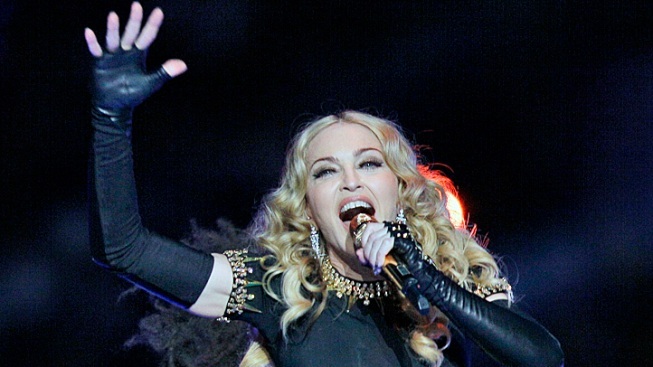 Following her stellar Super Bowl halftime show, Madonna is hitting the road and taking her show across the globe! The pop superstar announced on Tuesday that she's kicking off The Madonna 2012 World Tour on May 29 in Tel Aviv, and also including a stop in New York City at Yankee Stadium and numerous dates across America. The shows will include arenas, stadiums and special outdoor sights, including the Plains of Abraham in Quebec and a return visit to South America, as well as Australia, where she has not performed in 20 years. The tour will stop in 26 European cities, including London, Paris, Milan and Berlin. Stateside Madonna fans fear not, the singer is also bringing her show to North America with 26 shows in the U.S. and Canada. Her first North American stop is Philadelphia on August 28. Other stateside dates include September 6 at New York's Yankee Stadium and October 10 in Los Angeles at the Staples Center. Tickets are scheduled to go on sale beginning February 10 in Tel Aviv and the United Kingdom, with North American tickets going on sale beginning February 13. For more information and all of her concert dates visit Ticketmaster.com, LiveNation.com and Madonna.com.